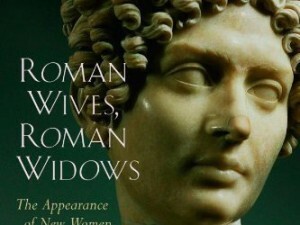 In Roman Wives, Roman Widows, Bruce Winter seeks to make a case that a woman wearing a veil communicated that she was married, faithful and modest. He begins his case by linking the veil to marriage through various historical sources. He mentions that Plutarch believed that “‘veiling the bride’, was in effect, the marriage ceremony” 1) Bruce Winter – Roman Wives, Roman Widows (Eerdmans, 2003) Page 78 and that “other writers in the early Empire confirm that the bride’s veil was an essential part of her apparel.” 2) Ibid Winter, by pointing out this evidence, seeks to convince the reader that the headcovering women were removing in 1 Corinthians 11 was their “marriage veil.” By taking it off they were identifying themselves as independent and immodest women. From this statement Winter concludes that Plutarch believed the “‘veiling the bride’, was in effect, the marriage ceremony.” 4) Bruce Winter – Roman Wives, Roman Widows (Eerdmans, 2003) Page 78 Wayne Grudem, helping to piece this connection together for the reader, says that the “chaplet of asparagus” put on the woman’s head was “part of the wedding ceremony.” 5) Wayne Grudem – Evangelical Feminism & Biblical Truth (Crossway, 2012) Page 334 Footnote #8 Second is Juvenal’s Satires which Winter footnotes twice. The first quote satirically portrays a man wearing what would only be appropriate for the bride. In this instance the “bridal veil” is indicated as a part of “the forms of regular wedlock.” Nero, presumably due to his immorality and perversion switched proper gender roles and wore the bridal veil himself. To help make this clearer, if a person peered in on a 21st century North American “wedding scene” they would likely see the bride veiled as well. We understand that culturally there’s a certain type of veil that only brides wear during their ceremony. 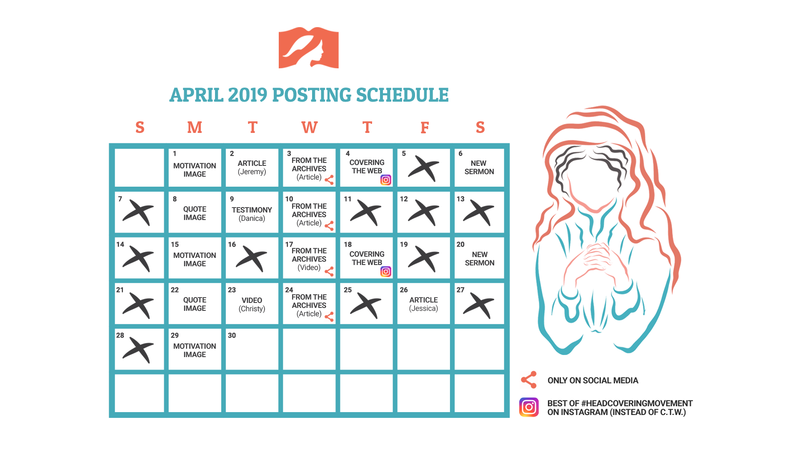 We would not assume that any veil was a bridal veil, or that if a woman was covering her head in a different context (like worshiping during a Sunday service) it would be a sign of her marriage. 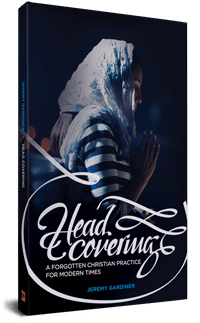 When we look at 1 Corinthians 11 we see that Paul is only concerned with what men and women wear on their heads “when praying or prophesying” (1 Cor 11:4-5) and the flammeum (bridal veil) wasn’t worn after the marriage ceremony. Because of this, Winter’s conclusion that Paul is dealing with women throwing off their cultural symbol of marriage, is not compelling. 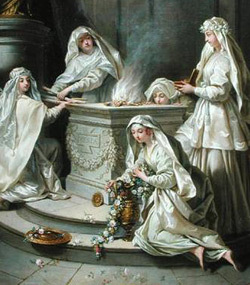 So here we have an example of a group of unmarried women (they took vows of virginity) who were publicly respected and they covered their heads. 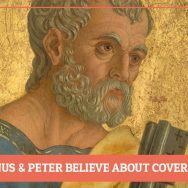 As we can see, viewing the “covered head” as synonymous with “married woman” cannot stand up to scrutiny. As Winter concludes this section he appeals to one last piece of archaeological evidence. 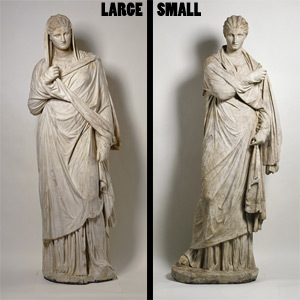 He sets it up with this question: “How did the dress of the immodest woman differ from that of the modest wife?” 21) Bruce Winter – Roman Wives, Roman Widows (Eerdmans, 2003) Page 80 To show the contrast he gives a description of another set of bronze statues found in the same city. These statues are of “two dancing girls” with “no veils or mantles.” 22) Ibid One is “undoing her dress so as to expose her shoulder and part of her breast.” 23) Ibid These girls conveyed “the exact opposite of the modest wife.” 24) Ibid Such evidence would be compelling if it was unanimous or had only few exceptions, but as we’ve already mentioned respectable women are seen without veils far more often than with them. These statues do nothing more than prove that these two women were immodest girls. In this section of the book Winter seeks to prove that wearing a veil was culturally the sign of a faithful, modest, wife. He begins by using various historical sources that show the connection between veiling and marriage. However, Winter does not distinguish between the flammeum (bridal veil) and other coverings such as the palla (which would have been worn by many women in day-to-day life). By not making this distinction he gives the impression that any veil is a “marriage veil” which wrongly leads to the conclusion that 1 Corinthians 11 is dealing with wives throwing off the symbol of their modesty and marriage. 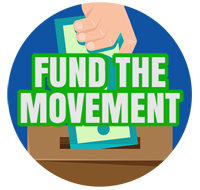 The archaeological evidence put forth fails to convince because it is not representative of the majority of findings. Winter does not mention this fact, which wrongly leads his readers to believe that what was presented in this book would be confirmed as normative in a larger sample size of archaeological evidence. By contrasting the unveiled dancing girls with the modest large/small Herculaneum women, Winter leads his readers to the wrong conclusion that the “veil” is what separates the modest from the immodest and the married from the unmarried. ↑ Kelly Olson – Dress and the Roman Woman (Routledge, 2008) Page 22. A matronae is a respectable married woman. ↑ This is an essay found in the book The World of Roman Costume, edited by Judith Lynn Sebesta & Larissa Bonfante. Thanks, Jeremy, for the debunking of these myths. Looking at the statues, it seems difficult to find too much difference besides the lack of the veil on the “small” statue. Winter’s comments seem to be a stretch, in my view–reading too much into what may simply be two different poses of two different women. Furthermore, reading the quotes about marriage veils, it’s easy to believe that it would be a “bridal veil” for the marriage ceremony only, just like women wear today. It’s always interesting to see arguments against Scripture fall apart. While looking for more information on vestal virgins, I discovered this: http://youtu.be/eA9JYWh1r7U a woman has tried to re-create the hairstyle of vestal virgins (and it’s the same hairstyle used by roman brides) and showed the complexity of their traditions. 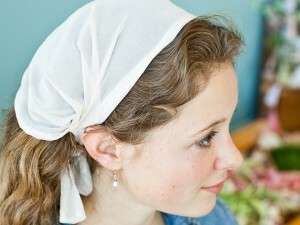 While current traditions are modest and simple by comparison, they styled their hair to assist with their head coverings – the point wasn’t to just hide it. I’m still of the opinion though, that hair style was an important status symbol in the Roman empire and in any public setting, great care would be taken to show off that status. Looking to 1 Timothy 2:9, Paul asked him to speak against elaborate braided hairstyles. And while yes, Ephesus (where Timothy was at the time) was in Turkey, it was also under Roman influence. Look at the other videos to see other ancient hairstyles she had reconstructed – the ancient statues and pictures do not show all women wearing head coverings at all times.